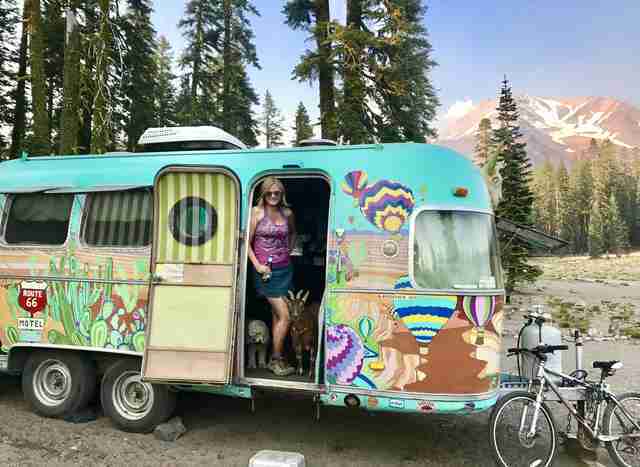 She lives in their vintage trailer with her friend, a dog. 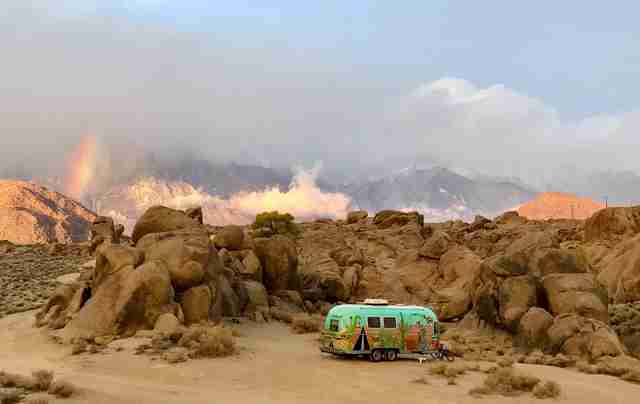 Just about everyone can empathize with the impulse of wanting to pack up and go on an adventure — but few have done what Cate and Chad Battles have done. Cate and Chad both moved around when they were young, but after they each established themselves in Asheville, North Carolina, and kids were raised, and their bar and house sold, they were ready to move onto the next adventure. They decided to make the travel-bug the governing force of their lives. 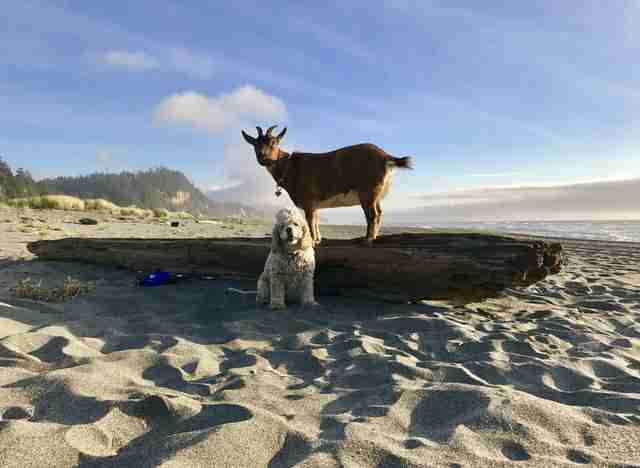 The fact that they had two beloved pets, a goat named Frankie and a dog named Maggie, didn't stop them for a second. 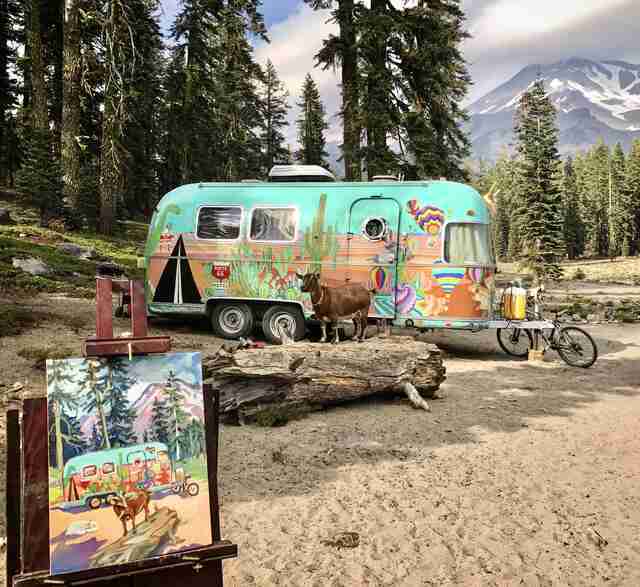 For the past year and a half, Cate, Chad, Frankie and Maggie have covered over 30,000 miles in their beloved vintage Airstream trailer, which they've made into a moving work of art. "Travel had always been a big part of our lifestyle, but between raising kids and juggling an extremely busy bar, vacations and quality time alone was few and far between," Cate told The Dodo. "We wanted the freedom of life on the road, to live in the moment, and to have a fresh start on life. We are always looking forward to the next adventure." Frankie joined the Battles family when she was just a baby, four years ago. At the time, the Battleses had two other senior dogs, and the pygmy/Nigerian mix grew up as part of the pack. Maggie has been part of the family since she was a puppy, 12 years ago. "Animals bring so much joy into our lives, I can't imagine living a life without them," Cate said. When Cate and Chad went on the road full-time, bringing Frankie and Maggie was a no-brainer. And they're learning along the way how to adjust to life in such a small space with three different species. 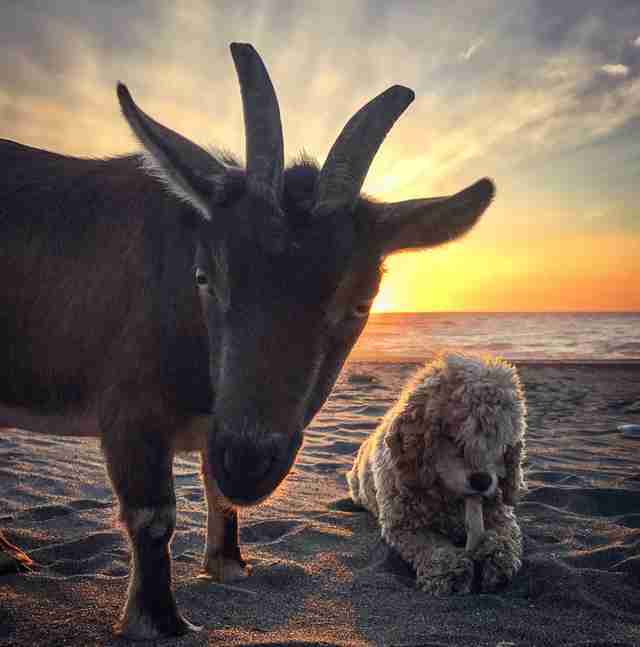 Frankie and Maggie, though very different personality types in addition to being different kinds of animals, manage to have a particularly sweet understanding of each other. "It's a relationship of mutual tolerance," Cate explained. "Maggie is very easygoing but Frankie is a diva. 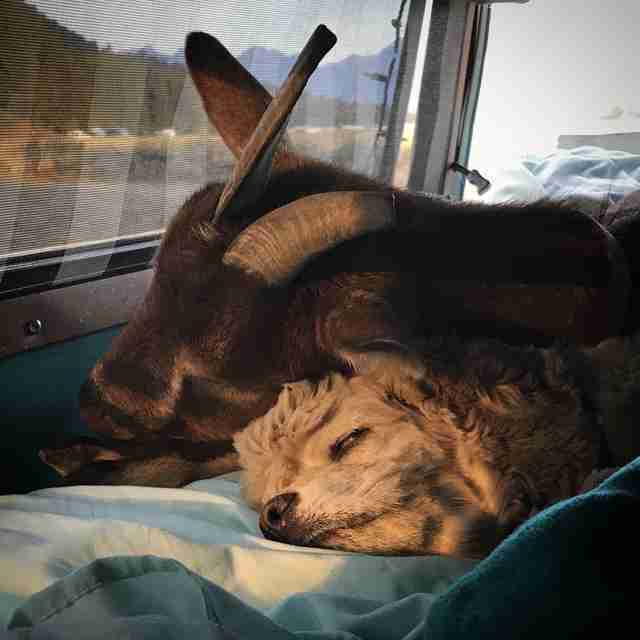 While we are on the road, they sleep together in the back seat and sleep in our bed inside the camper. They are both very snuggly and affectionate." But Cate suspects that both Frankie and Maggie prefer their humans over each other. 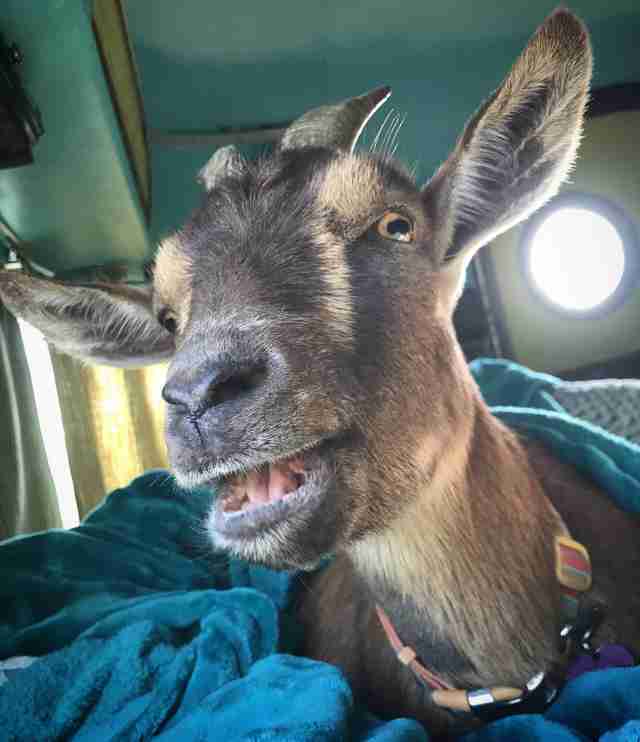 Frankie even seems to prefer people over other goats. 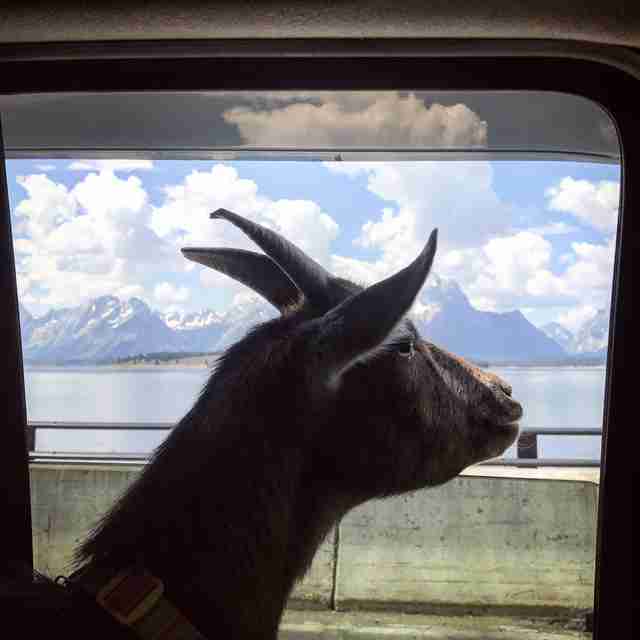 "We take Frankie to have playdates with other goats, which is super entertaining to watch," she said. 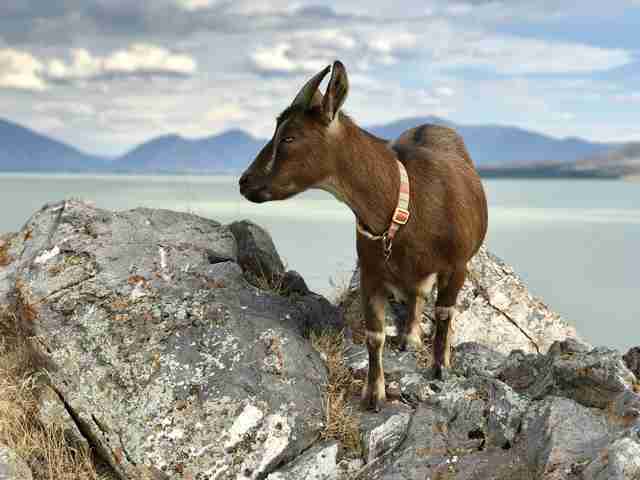 "But at the end of the day she's still more of a 'people goat.'" The Battleses have visited 28 states, two countries and so many state and national parks that when asked which ones were most memorable, it's hard to even pick out one over the other. "Seeing the total eclipse in the Tetons was pretty amazing," Cate said. "Frankie loved the flora and Maggie loved swimming in the lakes and creeks." 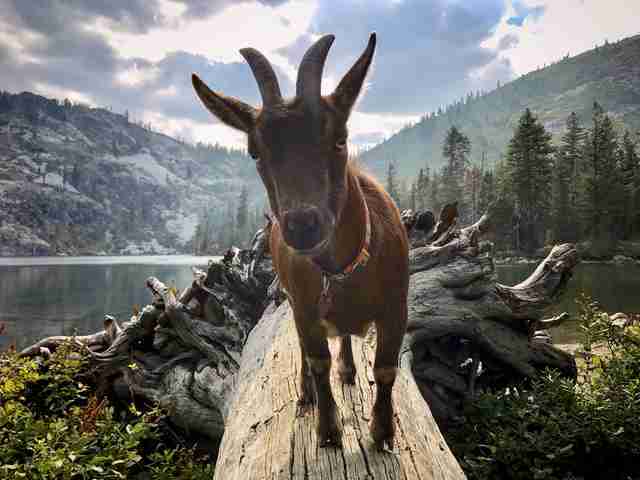 Frankie, being a goat, loves to climb, and so naturally gravitates toward rocky landscapes, like the Alabama Hills outside Lone Pine, California. 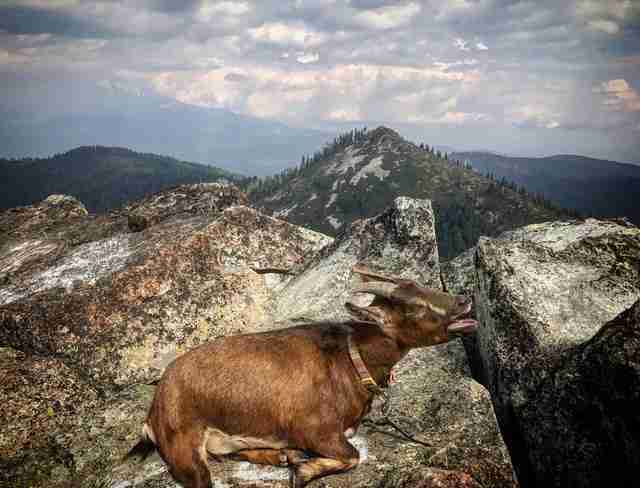 "There are so many wild rocks to climb and crevices to explore," Cate said. But there are some challenges in traveling with pets, as the Battleses have discovered. 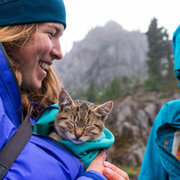 "The biggest challenge is that there are no pet-sitters on the road so they are pretty much always with us when we travel," Cate said. "That just means we've had to become better planners." 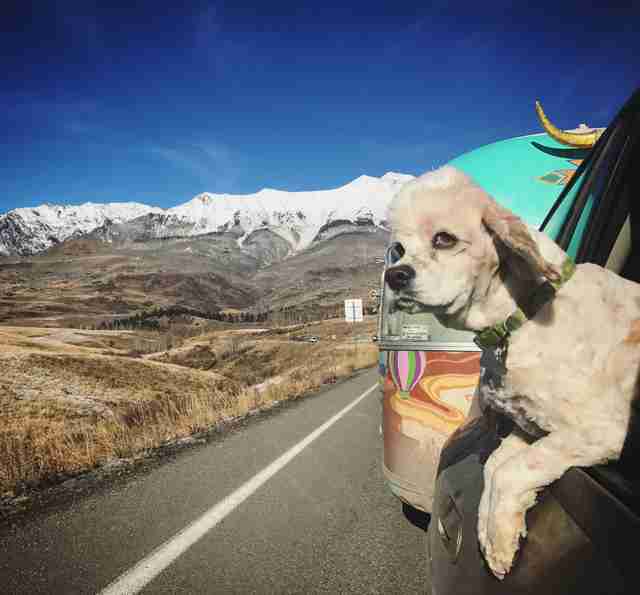 Because most national parks aren't pet-friendly, the Battleses let Frankie and Maggie enjoy the landscapes on the peripheries of the parks. "We will take the animals for a hike just outside of the borders and then take turns to see things inside the park," Cate said. 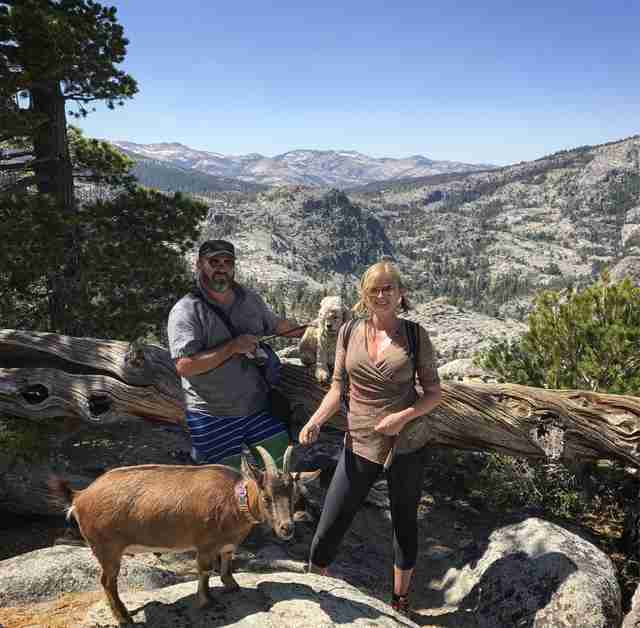 "Definitely not always convenient, but they make the adventure more interesting and they both love to hike." Despite some of the hassles, having Frankie and Maggie along for the ride ultimately adds to the couple's experiences, especially since Cate is an artist and photographer. 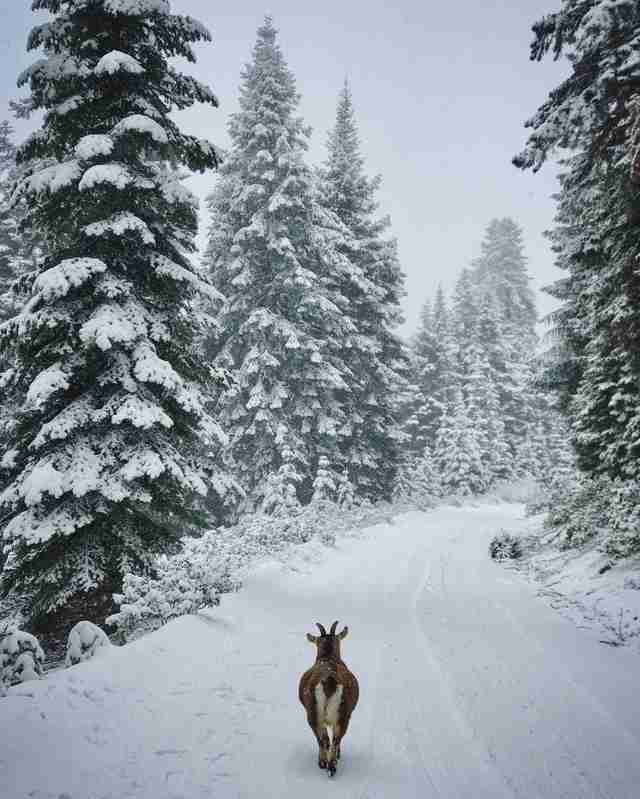 She documents the wild beauty of the landscape, and seems to see her unique pets as an important part of the picture. "We take them to bars, funky roadside attractions, and all sorts of points of interest," Cate said. 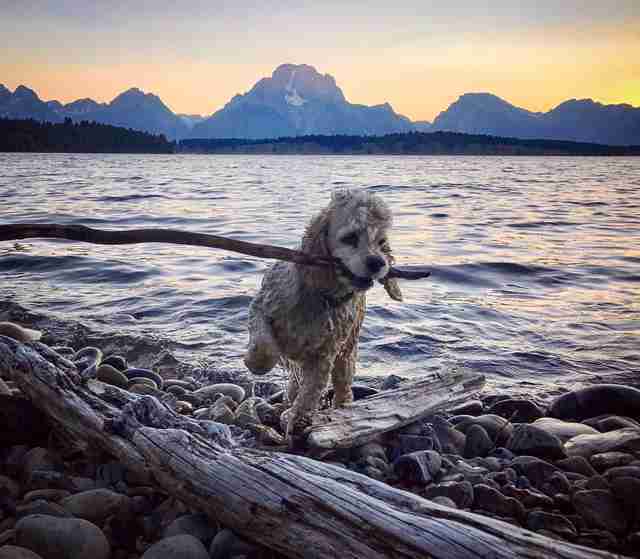 Some of her favorites have been Glacier National Park, Yosemite National Park, Mount Rainier National Park, the Oregon coast, Utah and the southwest, as well as Banff and Jasper National Parks in Canada. 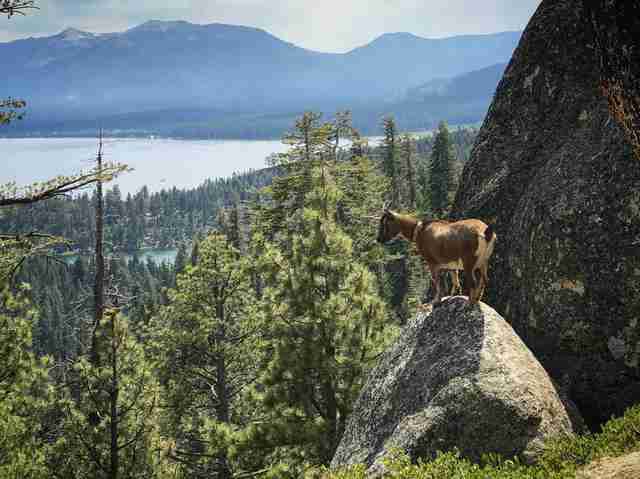 "We've been very fortunate to see so much of the beauty this country has to offer," she said. Philosophers argue over whether art imitates life or life, art. 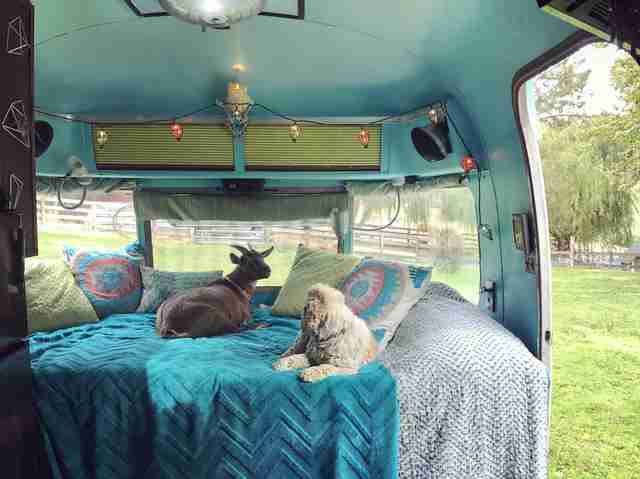 In the case of the pet goat and dog traveling in a vintage Airstream, it's accurate to say it's a little bit of both. "They are excellent travel buddies," Cate said. 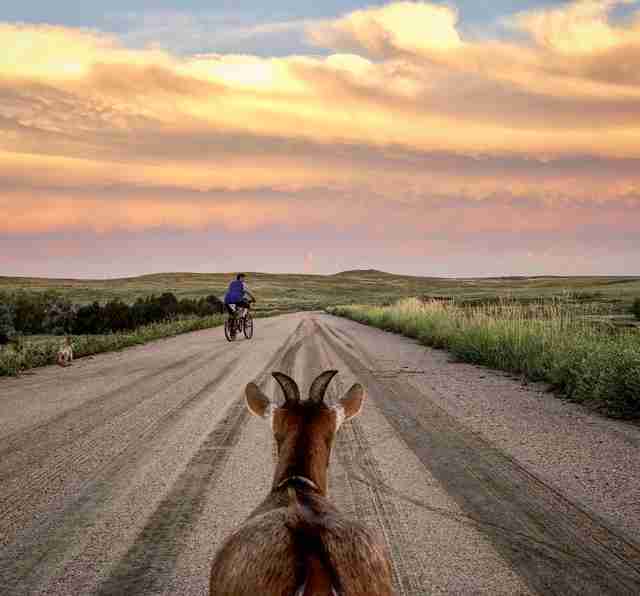 You can follow this family's adventures on their blog or on Instagram.